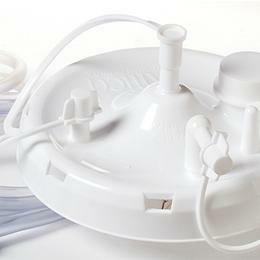 Suction Canisters With Tubing: They Are Designed With A Snap-On Lid That, Once Closed, Cannot Be Removed. The Unique D.I.S.S. Connection Allows For Direct Connection To The Regulator. The New Improved Self-Sealing Filter Increases Flow By 20% Over Float Types And Eliminates Back Flow That Damages The Suction Regulator And System. These Come With A Standard Stem Or Screw (Diss) Lid Or With Tubing Or Tubing & Solidifier Attached To The Lid. Suction Canisters With Tubing & Safesorb Solidifier 1500Cc, Stem Lid, With 20" & 6' Non-W/Conductive Tubing, 1500Cc W/Safesorb Solidifier.